Atelier OPA » Foldaway Office, exhibited in Shanghai, China. You are here: Home // Kenchikukagu (English), 建築家具（日本語） // Foldaway Office, exhibited in Shanghai, China. Foldaway Office, exhibited in Shanghai, China. August 5th – 8th, 2010. The 4th International Gift & Home Décor Trade Fair, at Shanghai Mart. 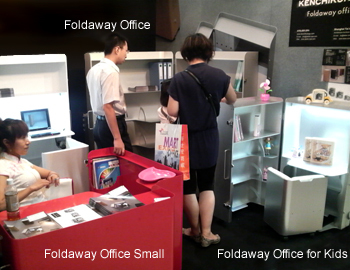 We exhibited “Foldaway Office (52-152-100cm)”, “Foldaway Office small (52-77-100cm)” and “Foldaway Office for Kids”. Television crew from four companies reported these new products. Do you like new one? 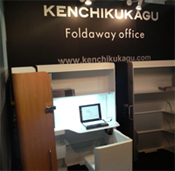 We start Make-to-Order Manufacturing for “Foldaway Office for Kids.” The price will be 120000 JPN. We will let you know this soon. Don’t miss our deals! Recently we have received a lot of inquiries about the series. Next we will release “Small” and “Kids”. “Mobile kitchen” will be completed at the end of this year, and “Foldaway guest room” will be remodeled next spring. So for a while we would like to offer only the Foldaway Office. If you want to be a Distributor, contact us. We will send you the price list of Foldaway office, the price depends on your order number. If you want to buy the Foldaway Office, and intend to pay the shipment cost and the customs, we can send it from our factory to your home. We can estimate all cost, so could you give us your full address. Architectural furniture, New model debut! Foldaway Office First model, 2008 June. KenchikukaguOpen and Close photo of the Architectural furniture, 3series. AIDIA JOURNAL 2008 vol.8, 3-3. Foldaway Office Extracts from paper. 1 Response to " Foldaway Office, exhibited in Shanghai, China. "